Chuck’s biggest film to date is probably his most remembered. The movie series “Missing in Action” also is close to Chuck’s heart. His younger brother Wieland was killed in action during the Vietnam war. And something very few know, Chuck’s first on-screen appearance was in the John Wayne Vietnam movie, “The Green Berets” in 1968 where he was a martial arts performer. “Missing in Action” debuted in theatres just months before Stallone’s “Rambo: First Blood Part 2”. Rambo was written by Hollywood heavyweight James Cameron but the story treatment and concept for the Rambo sequel had been tossed around Hollywood for a while. The writers of “Missing in Action” even give Cameron credit saying their film was inspired by Cameron’s story. Thus confirms all the controversy comparing Chuck’s MIA series to Stallone’s Rambo. When “Missing in Action” was rushed into production it was imagined as two films. Chuck in the POW camp would come first and then in the sequel would be his return to get his brothers out. Producer and co-writer Lance Hool would direct the first picture while “Friday the 13th: The Final Chapter” director Joseph Zito would helm the second feature. They shot the movies back to back. But in the editing room, the producers realized that the second film was the better movie. So Part 2 was dubbed “Missing in Action” and Part 1 was called “Missing in Action 2: The Beginning”. The second film being a prequel was very rare in the 1980s but producers wanted to get the series off to a stellar start. There is a reason why “Missing in Action” is one of Chuck’s best films, if not the best. It is a solid action film, has a story, allows for Chuck to use his martial arts but as well fire many weapons. The film also allows Chuck to act. I really enjoyed the scene where the Vietnamese tribunal forces Chuck to face his accusers. The great Asian actor James Hong is the leader of the delegation and the scene is rather tense because you have no idea what Chuck’s gonna do. The man is a walking time bomb and that’s so cool for the film’s opening. I also really enjoyed the performance from Chuck’s leading lady Lenore Kasdorf, who stands up to Chuck. There is some great chemistry between Chuck and Lenore it is too bad there wasn’t more of her in the series. “Missing in Action” is a fun brainless adventure yarn and solid action picture. I have to say I quite enjoyed revisiting the movie for this review. If it wasn’t for the film’s ludicrous sequels and comparisons to Rambo then I think this film would have been better remembered. Side note for action fans: Jean Claude Van Damme makes a cameo in the film. 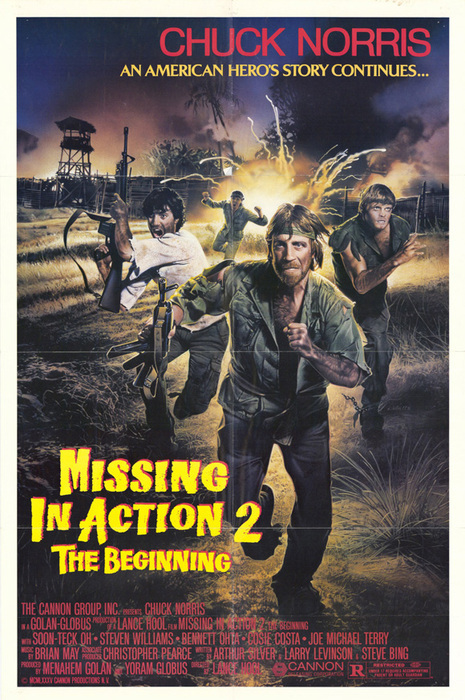 “Missing in Action 2” was shot before the first film and you can see that this film was in fact conceived before the original film. My only question is that if this was filmed before then why when Chuck has nightmares about the POW camp we see Vinh (Ernie Ortega) than his nemesis in this film Colonel Yin (Soon-Tek Oh). Or why wasn’t Vinh in the “Missing in Action 2”. This continuity bugs me if these films were made back to back. “Missing in Action 2” is flawed in so many ways. The script, action sequences and well dynamics are all messed up in the film. It should be a pretty straight shoot but we have implications that Colonel Yin is involved in the drug trade (never really resolved). He is friends with foreign pilot but their relationship is never fully developed. One of Chuck’s buddies is dying of malaria but his eventual death is by poisoning, huh? Then there is the whole Aussie walking into the camp fiasco, what? Then there is the final fight between Yin and Chuck. What was with that sissy boy fight scene? Those dozen punches when he hits Yin in the face. He missed his target by a mile. It was probably the worst choreographed fight sequence in Chuck history. There is a strong performance from Soon-Tek Oh who has a great time over doing his acting and pushing Chuck’s character to the max. Chuck has a very intense scene which shows the man crying for the first (and only?) time. You just know he was remembering his brother then. It was a major letdown as a sequel no wonder #2 was released first. “Braddock” was directed by Chuck’s brother Aaron Norris who launched his directing career with this film. He had been Chuck’s stunt coordinator since his brother’s first starring role in 1977’s “Breaker, Breaker”. 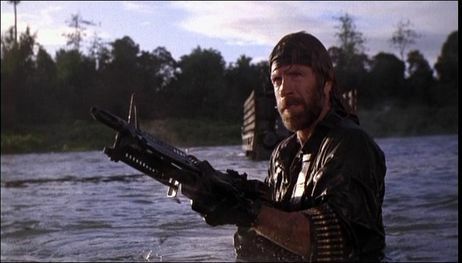 The story finds Braddock (Chuck Norris) at the fall of Saigon and trying to get his young wife out. Thinking she died in the chaos Norris leaves back for the States. Twelve years later he is visited by a priest who tells him that his wife lives and she gave birth to his son. So Braddock must return to Vietnam and bring back his family. The best part of this film is the opening. Norris does a great job of recreating the chaos during the Fall of Saigon. Keith David even shows up in the opening sequence as the captain of the guards at the American embassy gates. The wife’s supposed death is also done well. But then it’s all down hill from there. Let me say that only half of Chuck’s family makes it out alive. And that end sequence where a wounded Chuck falls to the ground and continues firing at a gunship with an AK-47 is just silly. Not to mention the rah-rah ridiculous climax. At least when Rambo took down a gunship it was doable but this was just absolutely moronic. This movie is just so awful and is one of Chuck’s worst. Here is a question nobody seems to be asking. If Braddock was a POW from 1972 until well after the war (Missing in Action 1-2), how was he at the fall of Saigon in 1975?